Indian food, or I should say Indian inspired dishes, I didn’t discover or even think to try until I was in my early 20s. I definitely am a child of the midwest; roasts, grilled chicken, steaks, mashed potatoes and corn. I still make all of these comfort foods from my childhood, but am incorporating new items into our daily menus as well. My craving for this spicy, creamy sauce has changed my menu planning, and found its way into my kids lives. Finnegan begs for this meal, asking me to make him the “orange” sauce. 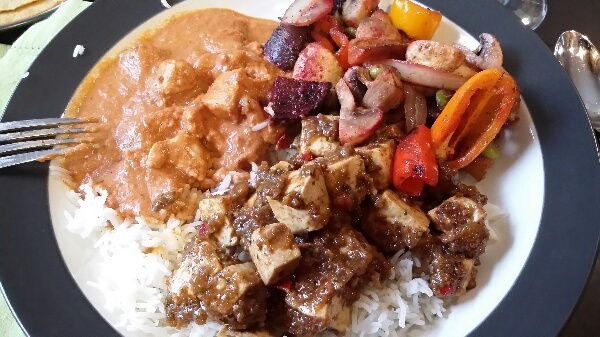 Pictured here is Tikka Masala, grilled veggies (peppers & onions) and Tofu Balti. I usually make a mild version of the Tikka Masala when I make spicier dishes for Paul and I. Then the kids have something to eat that is a similar style dinner to ours. In a large bowl, combine yogurt, lemon juice, cumin, cinnamon, peppers, ginger and 2 tsp kosher salt. Mix this in with the chicken. Cover & refrigerate for at least 1 hour. Preheat high sided saute pan. Lightly oil pan and saute chicken, carefully spooning out marinade as it cooks off of the chicken. Once chicken is cooked through, transfer to a dish and set aside covered with foil. Add in butter into saute pan and saute garlic for a minute or less. Careful not to burn the garlic. Add in the habanero, cumin, paprika and salt and saute another minute. 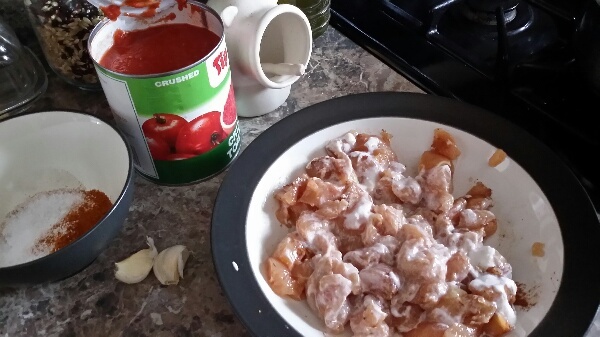 Add in crushed tomatoes and cream and simmer for 20 minutes. 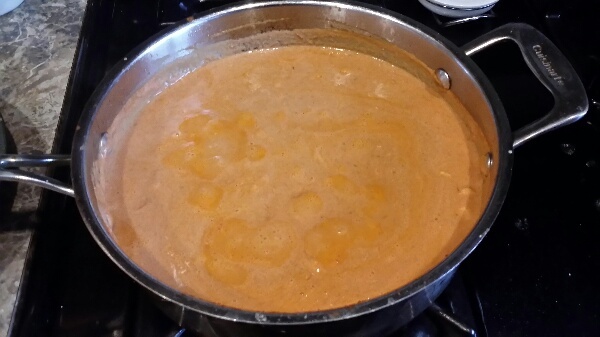 Add cooked chicken back to sauce and simmer until thickened; about 10 minutes. Transfer to a serving platter and garnish with fresh cilantro. Serve with basmati rice. You know I’ve been waiting for this one for quite some time. We’ll let you know how a European equivalent stands up. Have you tried this one out yet?